How do you classify Cambria? The stress is vertical, or so close as to be imperceptibly different. But the contrast is quite mild, and the serifs are massively bracketed. I am inclined to say that it has elements of oldstyle and modern so it ends up being: (1) transitional...-ish; and (2) a fine exemplar of the problems of type classification. I should add: very open apertures, for a serif face, unlike most modern serif faces. Medium contrast with vertical stress and bracketed slab serifs = clarendon. Modern, owing to the letter widths and axis. Oldstyle may be an ambiguous term because it's been variously used to describe everything up to the 18th century. So long as the details of one classification are grafted to the rhythm and proportion of another, the spacing still defines it function. A bit glyphic to I think. It's a lot controversal with several overlaping classifications. @James Puckett Agreed that it fits the “Clarendon” model pretty well. The schema I am trying to use (basically a descendant of the Vox-ATypI model) doesn't deal well with Clarendons... probably sticks some in slab and others in modern. Which probably means it's not a good schema for this purpose. Sigh. @Wes Adams Yes, if one relies on axis of stress alone (note: I am not saying that is unreasonable, just not my preference), “modern” for sure. The caps are a bit condensed, so they cease to be a reliable disambiguator between modern and old style proportions. The low contrast makes it seem not so much a modern to me—because I think of higher contrast being a feature of . After sleeping on it and thinking more, I am thinking the best thing to do for purposes of the job at hand is just to describe these variables, and downplay classification. I've always classified it as Cambria. Cambria has been designed for on-screen reading and to look good when printed at small sizes. for business documents, email, web design. Reader, since he knew they had been hinted for ClearType. of black and white shapes that scores well in a legibility test. scripts, conflicting ideas about consistency dogged the project. scripts, or making each conform to the standards of that script? I think this type has a strong relationship to the original Cheltenham, which has similar stroke contrast and serif structure. Cheltenham is classified as an oldstyle (its original name was Boston Oldstyle), and I don’t see any reason why Cambria should not be classified in that category, which is pretty broad. To my eye, Cambria has a kind of studied anonymity. That’s not necessarily a bad characteristic, though in this case it feels extreme to the point of unpleasantness. The terminals of the a, f, and especially r are clumsy and look as if they weren’t fully worked out. The lowercase is somewhat narrow, but the caps are even more so. The lowercase s looks expansive compared to the capital, which leaves me thinking that the type was edited by a committee. Mike: Thanks! I do have Now Read This, but I am sure it is of interest to many who have not seen it. Scott: I agree that it is rather like Cheltenham in most of the serifs, although Cambria's chiseled terminals (on a, r, f and s) contrast rather strongly with Chelt's rounded terminals. But although Cheltenham may have once had “oldstyle” in its name, that does not make it an old style typeface from a classification POV. The vertical stress pretty much rules that out, in my opinion. Cambria’s cap proportions are not particularly old style either, being condensed more than classical (and Cheltenham itself having pretty even, modern cap proportions). That said, I suspect our disagreement on this may be emblematic of why it is troublesome to classify. To build on what Christian and Thomas Höggren have said, to me it looks like an agate version of a glyphic style. As Jelle notes, it’s not a display face. It’s important to consider how a style would scale optically. 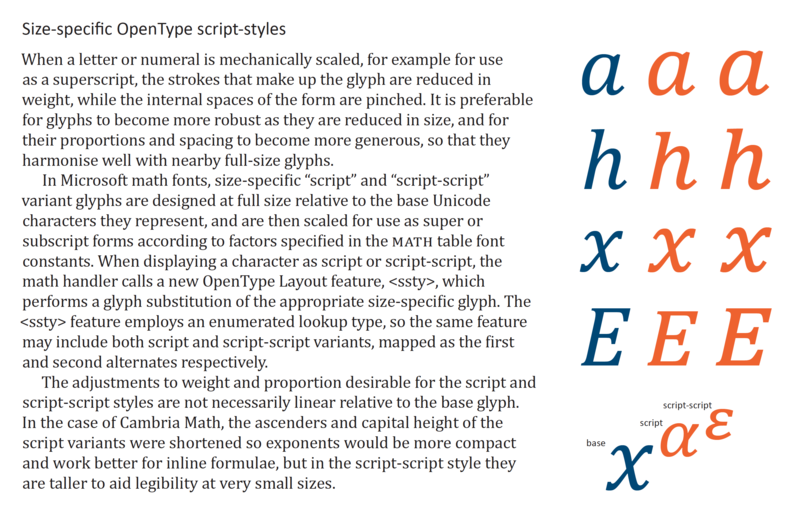 A subset of characters in Cambria Math do scale optically, but only in a downward direction. "Serif, low contrast, vertical stress, open aperture, high superness"
“Superness” is not a broadly used term in type, but “super-elliptical” is fairly well-known, I think. Cambria can be classified as: Transitional. But it adds weirdness because the vertical stems and serifs are those of a low contrast design, the horizontal for high contrast. You might say one direction has optical scaling for small sizes, the other for large sizes... A transitional slab-serif hybrid. At the time displaying serif fonts with ClearType at text sizes 0f 11-14 pixel per EM, worked best with low contrast designs. But these look dull at large sizes and in print, and do not combine very well with Sans. The design brief seemed to ask for high contrast. The hinting turns Cambria into almost a slab serif at the small ppm's. In the large sizes it has high contrast. Of course a true Display version may have lighter vertical hairlines and serifs and somewhat more elegant proportions. Thanks, Jelle! I am very happy to get your input. And I can’t object that you essentially agree that it is transitional...-ish.